The Gammacell® 40 Exactor Low Dose Rate Research Irradiator is used in labs throughout the world to explore elements of cell biology, and advance the scientific study of various areas of cancer and stem cell research. The Gammacell® 40, with its state-of-the-art control system, is engineered to give precise results. Timer settings can be chosen in increments of one second up to 100 hours and the control system allows manual or automatic operation. 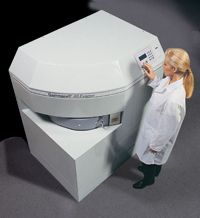 Dose uniformity is ensured through the use of two Caesium-137 sources and an electric drive mechanism which provides accurate results regardless of where specimens are placed in the large sample container. Research environments demand execution of protocols to exacting standards and replication of work with unfailing accuracy. The Gammacell® 40 is designed and engineered to meet these research environment requirements. The Gammacell® 40 has a wide range of applications in radioimmunology, radiosensitivity and cell biology. It is ideal for the irradiation of mitotically inactive cell culture media, mixed lymphocyte cultures and cellular blood components. The Gammacell® 40 also has a large ventilated sample container which makes it an excellent research tool for the development of murine models for cancer therapy.